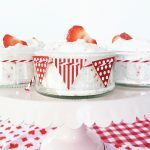 This Strawberry Cloud is a simple & delicious dessert made of whip cream and strawberries! Takes only 15 minutes to make! In a food processor blend together the frozen strawberries and 1/2 cup sugar. Once the strawberries have been blended, fold them in to the whipped cream. Evenly distribute the dessert between 6 dessert cups. Add slices of fresh strawberries as a garnish. Refrigerate until you are ready to serve! You can make this dessert ahead of time. I like to make it in the early afternoon of the same day that I’m going to serve it.